The Whitney Museum of American Art has assembled a sweeping retrospective of Andy Warhol?s work, spanning all four decades of his career, with particular emphasis on his early years. It is an action-packed show, with over 350 works of art produced in every imaginable medium. Whether you love to hate Warhol, or can?t get enough of him, ?Andy Warhol ? From A to B and Back Again,? will leave an impression. One of the most influential artists of the 20th century started life as Andrew Warhola, on August 6, 1928 in a two-room apartment in Pittsburgh. Warhol was the youngest of three boys, raised by devoutly Catholic parents from eastern Slovakia. Warhol had a few health hurdles to clear as a child and he was bedridden on occasion. His parents gave him a camera when he was 8 years old. Later, he signed up for free art classes at the Carnegie Museum of Art. He attended Carnegie Institute of Technology (now Carnegie Mellon University) from 1945 through 1949, receiving a degree in Pictorial Design. The summer he turned 21, Warhol moved to New York City, and dropped the ?a? in his name. He proved to be very successful as a commercial illustrator, with clients like Tiffany & Co., I. Miller and Sons, and Bonwit Teller. The exhibition, which was curated by Donna De Salvo, includes an array of his work from the 1950?s, including his hand-lettered business card, a drawing of a one-million dollar bill, and a design for a CBS radio news expos? about heroin called ?The Nation?s Nightmare.? In 1952, his mother, who was also an artist, moved to New York City to be with her son (until 1970, if you can believe it); there is a charming ink drawing on display by Julia Warhola of a cat wearing a hat, emanating waves of the word ?purr? in script (1953). Warhol created a series of artist books and then gathered his friends together to collaboratively hand-color the pages, an early indication of many collaborations to come. Early on, Warhol showed that he was unafraid to examine his homosexuality through his art, which was unusual for the time; in 1957, he exhibited his ?Studies for a Boy Book? at the Bodley Gallery. By the early 1960s, Warhol and colleagues such as James Rosenquist, Claes Oldenburg, and Roy Lichtenstein were immersed in what we now call Pop Art. Unmistakably influenced by the intertwined concepts of mass production and consumerism that marked the 1950s, Warhol found creative inspiration in newsprint ads, comic books, television commercials and magazines. He found he could take something pedestrian ? like a Coke bottle ? and isolate it on the canvas, glorifying the object in a way that both bemused and confounded (in this way, his work is quite similar to the pastries depicted by painter Wayne Thiebaud, who also got his start in advertising). In 1962, Warhol began transferring photographic images on to canvas via the silkscreen printing process. Mistakes which occurred during the printing process ?ink blots, bare patches, streaks, and registration marks ? were an integral part of his style. In 1962, his series of Campbell Soup cans were exhibited in a gallery in Los Angeles, and in 1969, Warhol tried his hand at sculpture, creating large Brillo boxes. 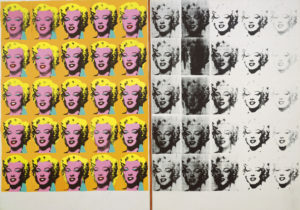 Thanks to an innate ability to spot the latest cultural obsession, Warhol struck gold ? and a national nerve ? with his portraits of celebrities, including Jackie Kennedy, Marilyn Monroe, Elvis Presley, and Liz Taylor. Other works from the mid-late 1960s reflect news headlines, often relating to difficult subjects like capital punishment, violent crime, and civil unrest. One thing is clear: Warhol liked making portraits, whether they took the form of mug shots (<Most Wanted Men>, 1964) or the Mona Lisa (<Thirty Are Better Than One>, 1963). In 1965, Warhol declared he would not be bound by just one medium and by 1966, he had founded an experimental group called Exploding Plastic Inevitable, which was geared toward performance art and multimedia installations with sound, light, music by the Velvet Underground. Naturally, the exhibit includes a great many more works by Warhol, through the 1970s and continuing until his death in 1987. The canvases grow ever larger and yet his repertoire seems less inventive, with the exception of his fruitful partnership with Jean-Michel Basquiat in the mid-1980s. 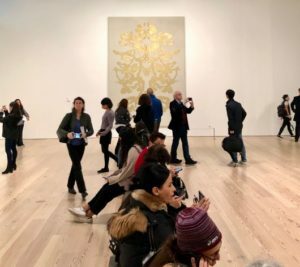 In the last gallery before exiting the exhibit, you will stand before Warhol?s enormous <Rorschach> (1984), which is rendered in shimmering gold. One could argue that in this painting, and in the artist himself, we see what we <want >to see. ?If you want to know all about Andy Warhol,? the artist once said, ?just look at the surface of my paintings and films and me, and there I am. There?s nothing behind it? (from ?The East Village Other,? 1966). A year before his death, Warhol created the work you see in the hallway as you head for the elevator: it depicts a brick wall.